The mention of oxtail ramen makes me feeling a little nostalgic. It brings me back all the way to Oahu, Hawaii 🙂 That’s where I had my first oxtail ramen. At Ramen Nakamura in Oahu. That little shop always has long queue. The Japanese and tourists from all over the world will go to that little shop to have Ramen. I have to say they have good authentic ramen there. What caught my attention was the oxtail ramen. The two times I was in Oahu, I did make sure I had their oxtail ramen. Diners are seated at bar-type setting, kinda like social eatery where everyone sits next to each other on the stools. Though the place is tiny, but somehow it makes you feel welcomed and cozy. The first time we were there, we weren’t married yet, so no kids were involved. The second time we were there, the kids were babysit by grandma in the frozen tundra, so still no kids were involved. Thought I saw many tourists brought their kids there too, but don’t expect any high chair if your toddlers need one, there is simply no room for that. Not very family-friendly especially if you have small children. But the oxtail ramen is really good is all I can say. 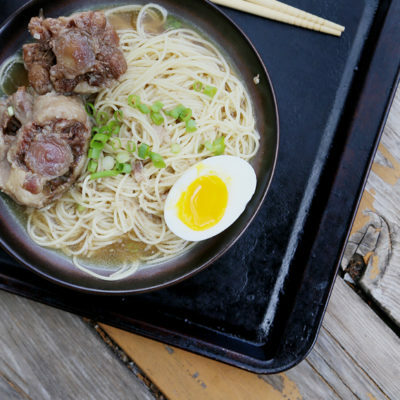 Making your own oxtail shio ramen really isn’t complicated. Shio means light-color base for the ramen. You need to be patient though, because the oxtail needs to be cook for 6-7 hours. It resulted in a very rich stock and tender-fall-off-the-bone meat. I usually cook the oxtail the day before and then put the stock in the refrigerator so I can scoop out most of the fat that renders out from the oxtail. The “lava eggs” are something I love to have with my ramen too. I’ve tried so many times with the lava eggs and they often came out overcooked or too undercooked. I’m glad to say that I’ve nailed it this time around. Such a perfect combination on ramen!!! 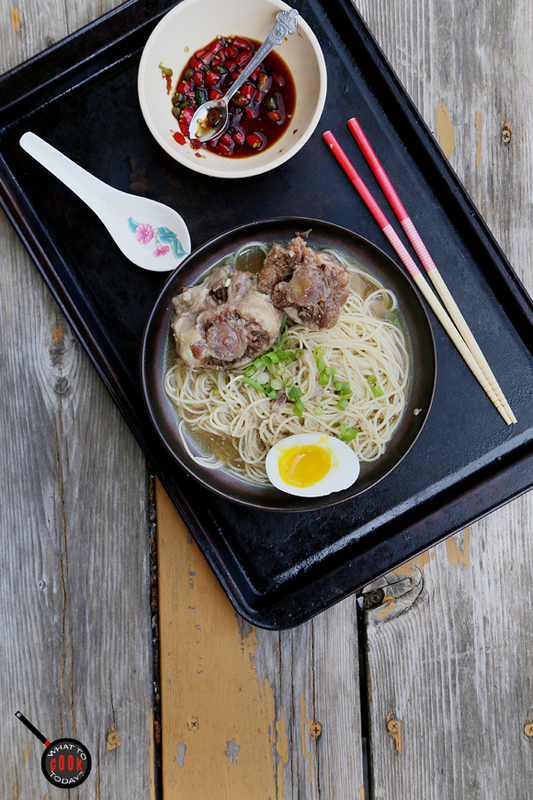 When I made this oxtail ramen, my husband and kids are delighted for sure !! 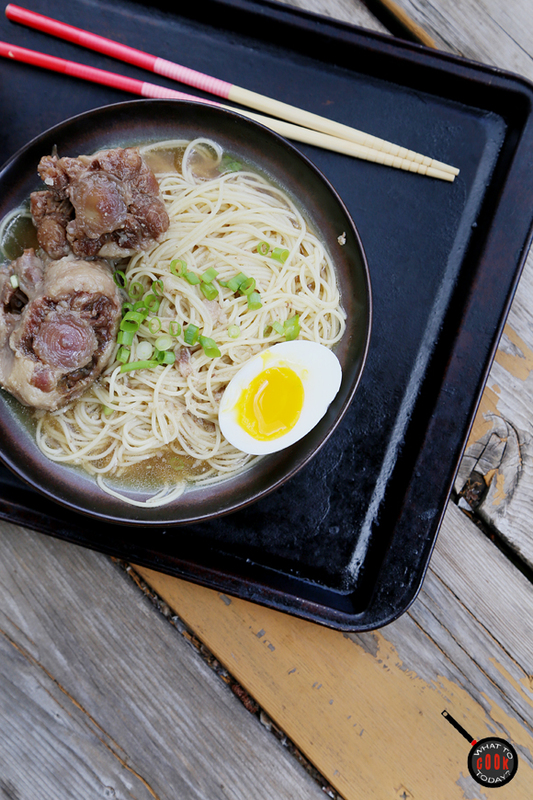 !We were in heaven with this bowl of oxtail shio ramen.